Vous passerez de bonnes vacances à Mammoth Lakes lors de votre séjour à Sierra Megève # 31. Ce complexe de condos est idéalement situé pour accéder à des activités toute l’année. En hiver, les clients apprécieront la distance de marche de Canyon Lodge, juste en bas de la rue. Les activités à proximité dans la saison ensoleillée incluent la randonnée, le vélo, le golf et la visite du centre-ville pour faire les magasins et dîner. La grande cuisine est parfaite pour éviter les tracas de faire la queue dans un restaurant. Préparez des repas maison dans le confort de votre propre condo. Préparez n'importe quoi, d'une collation délicieuse à un repas gastronomique. Au moment du dîner, appelez tout le monde à la table. Le salon dispose d'une cheminée et d'une télévision à écran plat. Après un après-midi de snowboard ou de ski, allumez la cheminée et installez-vous confortablement sur le canapé. Un lecteur DVD, un magnétoscope et une connexion Wi-Fi sont fournis pour votre divertissement. Le canapé s'assemble en outre dans un canapé-lit pour 2 personnes. Tirez les rideaux vers l'arrière et ouvrez les portes des balcons privés pour vous rafraîchir. La chambre principale dispose d'un lit king-size, d'une télévision et d'une salle de bains attenante pour plus d'intimité. La première chambre a également un lit king-size, une télévision et une salle de bains attenante. La deuxième chambre d'amis peut accueillir les enfants avec un lit superposé double et un lit simple. Vous trouverez une salle de bains à proximité à partager avec tous les invités. Cette unité de la Sierra Megeve a 1 place de parking souterrain assignée (hauteur du garage 7'2 ") et 1 place supplémentaire dans la place réservée aux invités souterraine ou à l'extérieur, en fonction des disponibilités. Il y a un spa extérieur et une piscine ouverte en été. Chaque bâtiment a accès à une laverie. Katie S.Where do you live? Plenty of space for our party of 7, and a well equipped kitchen too. Several pluses to this property, it was clean, very close to the slopes and it was quiet. We would rent it again if we were coming back to mammoth. A couple of negatives were the shower heads were awful in all 3 bathrooms, there were no comfortable chairs to relax in and the TVs didn’t work in 2 of the bedrooms. The condo is older and could use some remodeling but we didn’t come to mammoth to sit in a luxurious condo, we came to snowboard and ski. The property fit our needs and overall we were pleased. The bunk bedded room was not what we were expecting . The bed across from it had a full size box spring with a twin mattress on it . We needed that full size bed , so it was the start of a bad rental experience yet to come . The tv in that room also didn’t work. The bedroom next to it smells like sewage .. we bought bottles of febreze to mask it and still didn’t fully cover the order . Also tv didn’t work and the carpeted bathroom didn’t help with that odor. There was one non stick pan in the kitchen scratched so bad it would be a health hazard to cook with it . We also had to buy a pan from Vons to have eggs in the morning .the heater next to the kitchen table was so dirty I gagged at my first meal there. Now the bedroom upstairs also had carpeting in the bathroom so odor was a problem there also but the worst part was after a day of skiing I couldn’t take a shower. The shower head didn’t spray. It was like a leaky faucet. Couldn’t wash my hair . I paid a lot of hard money for this trip and truly left disappointed except for the fact that we love mammoth and come here every year for 18 years . Now I’m enjoying it with my grandkids . I think this place needs a serious upgrade or at least mention all the flaws. I have pictures of everything I mentioned except for the nasty odor . We sincerely apologize for the lack of cleaning in this home. Our housekeeping team has been notified of this review to pay better attention to this unit when doing their next cleaning. This is not the experience we would like to leave with our guests & we are so sorry about this inconvenience. Thank you. Very nice condo, we had a great Chrismas! Beautiful place overall. Just the showerheads need to change. Very clean, cozy, and quiet. The whole family praised my pick! Very clean, and had more than we were expecting. Had an issue with the Wifi and the customer service staff resolved it in a very timely manner. Would definitely stay here again. In desperate need of a complete upgrade. We have stayed in numerous properties over the years and this is the first I have had to complain about. 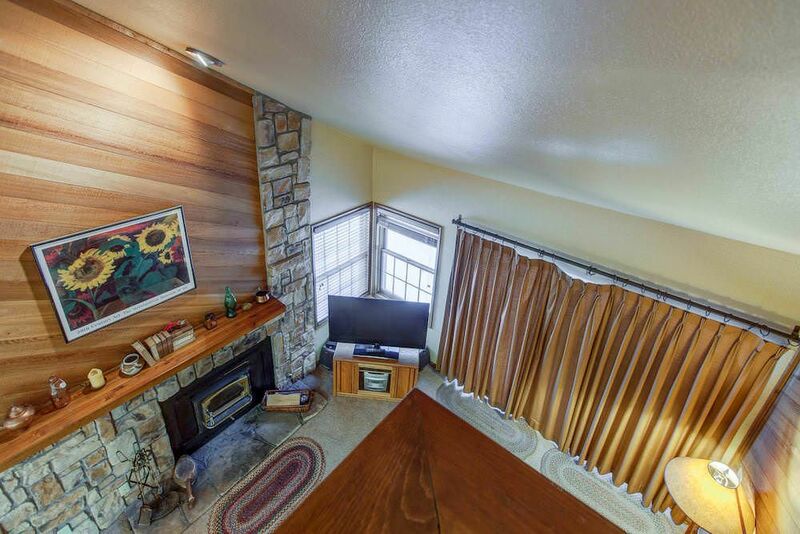 Let’s start with the positives: this condo is very close to the ski lifts and has underground parking. Not too far to stagger back after a hard day’s skiing. However, you do have to walk up two flights of stairs to get to the condo (no elevator). The condo is nicely laid out but all fixtures and fittings are old. The bathrooms are very dated, with poor showers and toilets that are difficult to flush (especially in the mezzanine bedroom). The carpets are stained. The blankets and bedspreads on all the beds are old, poor quality, and even worse stained and dirty. We had to send three away to be cleaned (which we didn’t see again during our stay). That was the worst for us - that housekeeping had made up the beds with blankets that they could see were dirty. We complained three times during the week to the Grand Mammoth Resorts office and the staff were pleasant enough on the phone but did not apologise. Two of the dirty blankets we left outside the condo (at their request) were still sitting there 3 days after we complained about them. Very,very disappointed and we will not be staying here again. Hi Jonathan, Thank you for staying with us in Mammoth. We are sincerely sorry for the inconveniences you encountered during your stay. The lack of service and condition of the blankets are inexcusable & we sincerely apologize. We have passed these notes along to the management team and hope to provide a better experience in the future. Thank you!